Posted January 30th, 2012 by David Porter & filed under Social. 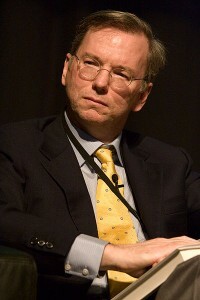 Google's Schmidt: Sell Your Soul to Him? MBF Blogs over recent months have carried a number of articles about angles of privacy in the internet age. This issue has stayed near the top of the web/regulatory agenda, so we return to it with an update on what Google are doing as the European Commission continue to look closely at internet privacy. Most internet service agreements and contracts, like paper ones, require a customer to read, accept and sign the terms and conditions. Few actually do read them; but everybody who enters into any agreement has to sign them as read. Matt Warman, writing in the Daily Telegraph about internet privacy (January 2012), said that since most companies have stopped even showing the Ts and Cs, which are ‘legalistic, jargonistic and entirely unread’, this encouraged British game retailer GameStation to insert a line that users were required to promise ‘to hand over their immortal souls’. This is from the old German play, story, legend of Faustus, in which a bored intellectual in return for unlimited knowledge and worldly pleasures signed a pact with the Devil who in due course arrived to claim the man’s soul, despite his protestations. GameStation apparently have 7500 souls they have yet to claim. From 1st March this year, new Google terms will apply to all users. They say they will make the ‘services better’ that you sign up for. When you share information with them, they will show you more relevant search results and ads. Note, there is no option of literally seeing no ads at all. They will also ascertain who are the ‘people who matter most to you online’. And then, in the spirit of openness they are coming clean with what they do with all the information to open a Google Account you ‘share’ with them. Apart from personal data you have more or less had to hand over (name, email address, phone numbers and credit card details), you might have offered a photo of yourself. You also have revealed more through the services you use, like when you visit a website that uses Google Ads and how you interact with them. They will take data from device-specific information (hardware model, operating system version, unique device identifiers and mobile network data). They will scan server logs, telephony log information, IP addresses, SMS routing, cookies and types of calls. Device evident info like crashes, system activity, hardware settings, browser type and language, date/time of requests and referral URLs are also opened. Locations are important in selling ads tailored for your personal settings, so location-enabled Google services, GPS, nearby Wi-Fi access points and cell towers will also be harvested. Any web service where you have been given a unique application number, browser web storage banks and application data caches, the same. Anonymous identifiers, cookies and pixel tags are another rich source of information that you have given up involuntarily. They say they will avoid sensitive data like choices you make based on race, religion, sexual orientation or health. And, Google keep reiterating, this is all in the name of providing, maintaining, protecting and improving services to ‘offer you tailored content’. They may now pass on the name you provide for your Google Profile to all services where users have some part of your personal data already. You can ‘review and control certain’ types of info by using Google Dashboard; view and edit your ad preferences; edit how your Google Profile appears to particular individuals and control who you share info with. They say you can also set your browser to block all cookies, including theirs. If you took that option, then you might lose out on your bank contacting you … and as they say, if cookies are disabled ‘many of our services may not function properly’. They are very keen to point out that they protect against ‘accidental or malicious destruction’ of your information, and it is only shared outside Google unless you agree or for legal reasons. Non-personal data like trends are understandably made available to all, and only Google staff, contractors or agents who need to know in order to process your data for them, have access to your stuff. Any caught breaking contractual rules may be ‘disciplined or terminated’! European Commissioner for Justice, Vivianne Reding, applauded Google for quickly addressing privacy concerns by moving ‘in the right direction’. However, some privacy campaigners remain unconvinced. The Search Plus Your World (SPYW) feature incorporates content from searches from social network Google+, so it could turn out that you will see only the views of your ‘friends’, and so sully the traditional purity of traditional web search. Matt Warman’s article said that at the heart of the privacy debate is the ‘future of the business model’ for the internet. Only all that information they hold makes advertising so lucrative. And that’s what keeps the web free, for now. Daily Telegraph, Matt Warman, The Faustian Pact we all sign up to with websites, 26 Jan 2012. How the Google Effect Reprogrammed Our World. Data is the Never-Ending Fuel of the Web-Network Economy.